Wow, this was much better than the first book. I actually read this in one day! Review to come in a bit! I want to thank the publisher, HarperTeen, for supplying me with an eARC through Edelweiss to read and review. Receiving this book for free has in no way altered or influenced my opinion or review. So, I can honestly say that I wasn't expecting all that much from this book. A friend sent me a copy of the first book to read, telling me it was one of her favorite books. I was super excited to open it and see what was inside, then I read it and I was disappointed. It's not that the story line wasn't good, it's just that I didn't feel a connection. So, given the chance to read this book, I wasn't sure what I would even get out of it. I thought for sure I would trudge through and then end up feeling blah. Boy was I wrong. Compared to the first book, this one is so much better. I can't pinpoint it exactly. It's not just one thing, it's a slew of things. So read on and I'll explain. WARNING: If you have not read the first book in this series, STOP HERE! There will more than likely be spoilers from that book and I wouldn't want to ruin the series for you! I'll start with the cover. Wow! I loved the cover of the first book. The colors jumped right off the page. And the face of the model, so hauntingly beautiful. So, I'm not surprised that this cover is just as beautiful. I was not disappointed when this one was revealed for sure. Fia, she really didn't grow as much as I would have liked to see in this book. As a matter of fact, it was all the other characters that grew around her that really helped her get through this book. She still has her OCD tendencies that got on my nerves in the first book. All the tapping and the repetitiveness of her speech. But seriously, this girl is all kinds of messed up and I can see how she would never be able to be right in the head with the training she's gone through and the things she has had to do. She so unstable it's sad to watch her break apart. So it's really the other characters around her that carry her through this book. That make her look stronger than she really is, that make her look like she knows what she is doing. I still could not emotionally connect with her in this book. As a matter of fact, my disconnect may be what White intended, but I'm not in her head so I'm just not sure. I can see that Fia's stream of consciousness is toned down in this book, very much more believable than it was in the first book, although still a bit irritating. Annie is the one with the most growth in this book. She went from this recluse of a girl who was dependent on everyone to the hero. Seriously, this girl grew some true grit during this book. Not only does she break out of the shell that has been holding her in but she learns to defend herself and takes chances you never thought you would see her take. You forget that she's supposed to be dead to everyone and could just move on and become someone who blends in with the crowd never to be seen again and watch as she takes control of her life, and Fia's. And she doesn't let her "handicap" define her by any means. As a matter of fact, she still sees thinks despite the fact that she is blind. Her ability to flesh people out and understand situations is even more heightened because she is blind. It's an amazing transformation. And this is really what made this book for me. And I loved getting to know more about Cole. This guy that we thought at first was supposed to be all bad turns into someone we grow to love and someone Annie learns to rely on and trust. I would love to see his story as a novella. And my distaste for James grew more as I read through this book. I still have no idea what his motives or agenda were, I still am not sure if he truly feels love for Fia or if it's just him using her to get what he wants. Even at the end, I don't feel like there is closure in their relationship, and this bothers me. I need to know if it's over, if Fia moves on, or if she remains in her same rut with him. The pacing of this book is much quicker than the first book. I think for me it was because the story was so much more interesting and captivating. Kiersten still has the same style, but it seems to be much more grounded and tight than in the first book. it's a peculiar style that you will either love or hate. I can say I disliked it in the first book, but found it much more enduring in this book. I felt like I was all over the place in the first book, not quite sure what she was trying to achieve with how addicted Annie is to Fia or how crazy Fia seems to be. But in this book the cadence helped me really fall into how the book was supposed to flow. I was surprised when I realized I was 75% through with the book and had really just started to read it! I will say that at times the chronolgy confused me. The fact that the book was from two different POVs may have added to this. There were a few areas where is seemed Fia and Annie's stories overlapped, but things happened differently for them. The one scene that stands out in my mind is when they find Sadie. Fia sees things happen one way, while Annie sees them happen another way. Now, it could be that originally Annie had a vision of what happened and my mind went to that instead of what actually went down. But either way, I had to reread the section and it was still confusing to me. Another thing that helped me like this book so much more were the motives of the characters. While we are well aware of what Keane wants to accomplish, we are torn with what Fia wants to do and not sure if she can trust that James is on her side. Then we see Annie pop out of her shell and watch as her motive becomes keeping her sister safe, no matter what the circumstance. But it's not just Fia that she wants to help, it's all the girls that Keane has exploited for his purposes. She wants to become the savior for them, and she has many backers (Cole, Mae, Eden, and Sarah to some degree). I do think that White could have fleshed out a few characters more, particularly Sarah and Raphael. And I would have liked to see a bit more from Adam, after all, he is really what started the ball rolling in this series, the reason that Fia and Annie started their fight in the first place. But White puts him a bit on the back burner and I feel like he should have had more interaction to show why he was of such importance to the story. There is no question that White creates a story of characters who have extreme baggage. Do they come out unscathed, no way. And I truly don't think this would even be possible with the things they have experienced. But, they do take control of their lives and they do turn things into what they need to survive. I'm not sure if White will write another book in this series as I see this has been set as a duaology, there is certainly so much more that can be explored. I am satisfied with Annie's ending, but I still need to know more about how Fia's life will fall in line (or not). And the book is filled with non-stop action that drags you right into every scene wondering what will happen next. Watching as the visions Annie and the other Seers play out, watching as they don't happen exactly as they were seen, this is what makes the action so interesting and what really kept me reading. I had to know if things would go as they were seen or if other forces would counteract what I truly thought would be fate! Overall this was a fantastic read. And, despite me being hesitant to take it on because of my feelings for the first book, I'm really glad I stuck with it. 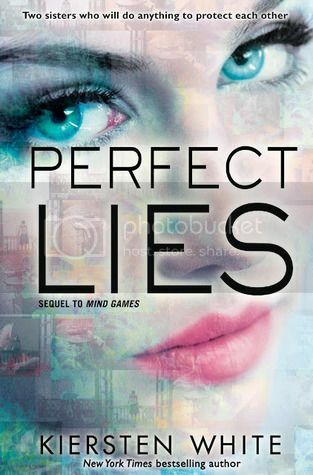 If you weren't a fan of Mind Games, I do beg you to give this one a try as it has a different feeling and the connections you feel with the characters you thought were not important will surprise you!